The BLACK & DECKER Bare 20V MAX Lithium Ion Alligator Lopper Saw is ideal for cutting limbs up to 4″ in Diameter, limb and branch pruning and great for storm clean-up. This bare-tool unit is compatible with 20V Lithium battery, providing up to 150 1-1/2″ diameter cuts per charge and long battery life year after year (battery and charger not included). 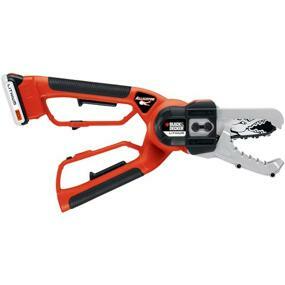 The heavy-duty cutting bar and chain quickly cut branches and logs up to 4 in. 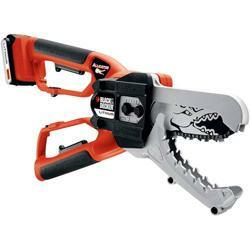 thick and the patented clamping jaws grab and cut limbs and brush in one easy motion. 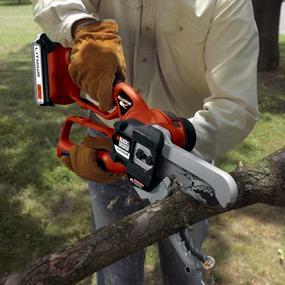 This featured scissor-action makes cutting branches effortless. For safety purposes, the dual-hand switches must be actuated for cutting to prevent accidental starting. The cordless LLP120B alligator lopper (view larger). 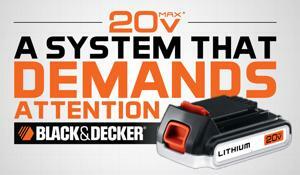 Get the power you need with Black & Decker’s 20-volt lithium system (view larger). 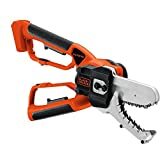 An ideal tool for pruning tree branches up to 4 inches in diameter, cutting branches into manageable pieces, and cutting of fallen branches after storms, the Black & Decker LLP120B cordless alligator lopper provides powerful, fast cutting and its innovative clamping jaws grab and cut in one easy motion. It also includes a heavy duty cutting bar and chain to deliver fast cutting of thick branches and logs. Note: This Black & Decker cordless tool does not come with a 20-volt MAX lithium-ion battery. It’s a good choice if you already have other batteries purchased with other tools from Black & Decker’s 20-volt MAX Lithium lineup. If you need a battery, this sweeper comes in a package that includes a battery and charger, or you can purchase a LBXR20 battery separately. It’s powered by a 20-volt MAX lithium-ion battery (available separately) that offers a longer lifespan and retains its charge 5x longer than similar 18-volt NiCad batteries–and you won’t be limited by an extension cord. 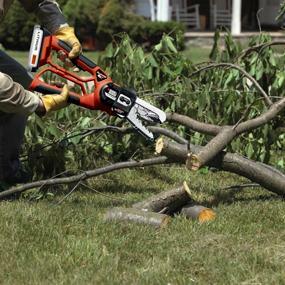 You’ll get up to 150 cuts of 1-1/2-inch branches per charge. The battery is also designed with 50 percent less battery weight, and the unit weighs a total of 6.8 pounds with battery installed. Offering the ultimate in controlled cutting, the alligator lopper’s rugged metal guards cover the jaws to protect you from the cutting chain and immediately snap back over the blades once the cut is complete. And the jaws won’t skip around like chainsaws when starting to cut. The alligator lopper cuts side-to-side instead of from top-to-bottom as with traditional chainsaws–preventing burying the cutting chain in the dirt as the chain cuts though, which can quickly dull a regular chainsaw. Since 1910, Black & Decker has been setting the standard for innovation and design of power tools, accessories, outdoor yard care equipment, home cleaning products, automotive and lighting products, hardware, and other home improvement products. The inventor of the first portable electric drill with pistol grip and trigger switch, Black & Decker has evolved from a small machine shop in Baltimore, Maryland to a global manufacturing and marketing powerhouse with a broad line of quality products used in and around the home and for commercial applications. When users need to get work done, they trust Black & Decker for the products that will do the job efficiently and reliably. Scissor-action makes cutting branches effortless (view larger). Cut branches and logs up to 4 inches thick (view larger). Dual-hand switches prevent accidental starting (view larger).